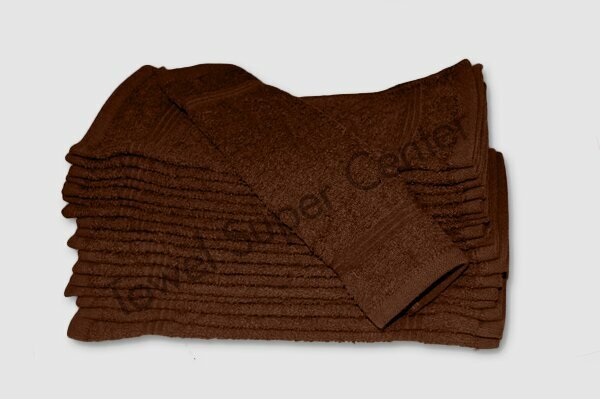 100% cotton washcloths dark brown size13X13-Premium quality extra soft, great for any commercial use or business that needs a heavy weight and extra soft, highly absorbent. Are you looking for a towel that is as distinctive and prominent as your business? With deep dark hues of brown and 13” X 13” dimensions, you can’t go wrong with our wholesale dark brown washcloths! When you make a purchase at Towel Super Center, you’re buying a product made of the finest materials. Our premium dark brown washcloths are woven with 100% cotton fibers, so they’re constructed with materials that are built to last even after fulfilling all of your drying needs. What’s better than a crowd-pleasing extraordinary product? A washcloth that’s not only built to perfection, but with a price that makes economical shopping simple as well! You don’t have to skimp on quality when you’re looking for a product at a good deal. Place your order at Towel Super Center to find out why our customers value the products and affordability we offer. Never settle for a towel that’s mediocre, especially when your business deserves to shine. Brown is a deep and enriching color — the perfect match for your salon, spa, hotel or home. Whether you drape our premium dark brown clothes in your bathroom or over a salon stool, you’re assured an aesthetically pleasing accessory that complements your interior surroundings. White is chic and versatile, but brown makes a statement. Our walnut-brown deep colored fabric is ideal for any home or business desiring an added flair. Your towel is designed to clean and mop up, but that doesn’t mean it has to look like the messes it touches! When you drape your towels over chairs or countertops, you’ll have a statement piece that not only pleases in aesthetics, but performance as well. Crafted with 100% cotton fibers, our premium dark washcloths are powered by quick-wicking material, cleaning up messes effectively and efficiently whenever necessary. While our premium brown washcloths stand out among the crowd due to their deep colors, it’s what’s inside that truly makes them shine. Designed with 100% cotton fibers, our towels reap the multiple benefits of such a functional material. One of the best qualities of cotton fiber products are their smooth finish. When your skin grazes our premium line of cotton washcloths, you’ll be touching indulgent softness. You’re guaranteed that whenever your customers reach for a towel to dry off their hands or face, they’ll be met with a material as smooth as their sensitive skin. Cotton is also known for its quick-wicking abilities. Whether you’re mopping up messes or soaking up moisture left behind on your skin, you want your towel to dry efficiently and fast. You’ll never have to worry about unwanted odors or smells because our towels absorb liquid quickly, assuring the only thing left behind is a smooth fluffy surface ready for the next use. When you order your towels, you don’t expect to have to place another order shortly after that due to a subpar product that fell apart after use. Our premium brown washcloths are crafted with strong and durable cotton fibers, which means continual washing is never an issue. When your washcloths emerge from the washer or dryer, they’ll appear as fresh and new as they did before their first use. Are you ready for a product that performs with style? Place your order with Towel Super Center — your one-stop-shop for all of your towel needs!